Begin with very cold butter, you can put it in the freezer for 10 minutes. Dice it with a knife into cubes about 1/3 inch across, they don’t have to be exact. In a large bowl, combine flour, sugar, and salt. Using a pastry blender, cut in butter until mixture resembles coarse crumbs. Add the ice water a tablespoon at a time and mix swiftly and gently. Flatten the dough into disks, wrap tightly in plastic wrap and refrigerate at least 2 hours or overnight. Roll the dough out to the desired size [12-13 inch for a 9-inch pie pan] on a floured surface with a floured rolling pin. Turn it frequently to maintain its shape and prevent sticking. Gently roll it over the rolling pin and transfer to your pie pan. Press the dough evenly into the bottom and sides of the pie plate. Trim dough to a 1-inch overhang using kitchen shears, fold under, and seal to form a rim, then crimp the rim with fingertips and knuckle. Using a fork poke holes at the bottom of pie. Wrap the plastic wrap and set in the fridge or freezer. The dough must be well chilled before baking. Add some aluminum foil or parchment paper onto the dough then weigh it down with rice, dried beans, or pie weights. Bake in preheated oven at 375ᵒF for 20-30 min. or until golden brown, then remove the foil or parchment. Cool completely and set aside. Filling: Bake pie crust in 9-inch deep pie dish and set aside to cool. Filling: Put the water, sugar, and cornstarch in a saucepan and bring to boil. Filling: Whisk constantly until it becomes thick. About 3 minutes. Filling: Then whisk in the Jell-O and cook for a minute longer. Filling: Remove from the heat and let cool for about 15 min. 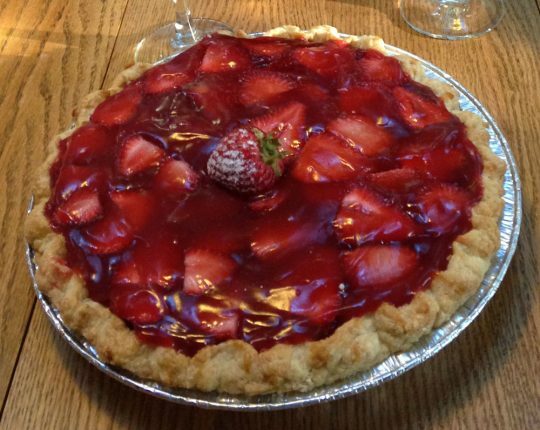 Filling: As the glaze cools, place strawberries straight into the pie crust. Filling: Pour the glaze over the strawberries. You can decorate with whipping cream before serving.